No, not Kevin. The food. As an aside, my friend has a "Bacon Number" of two. First, you take raw pork bellies (in case you always wondered about them on the financial news), which are pretty easy to find in Asian markets, at least around here. Then you coat them with a curing salt. I use "Tender Quick" but you can combine salt and TCM as an alternative. And then some sort of sugar type thing. I used brown sugar here. You leave the bacon in the fridge with the temp between 36 and 40. I used the vegetable drawer. 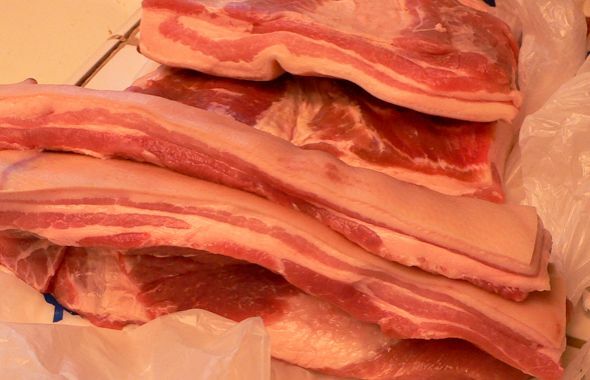 You need the cure to go for 7 days, and should "overhaul" or turn the bacon to make sure the cure is getting to all sides once or twice during the process. 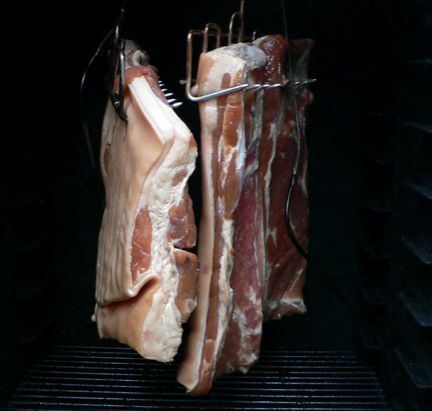 The next weekend (because, of course, that's the only time you have to do things like this) you smoke the bacon. Less than 120 degrees, for about 8 hours. 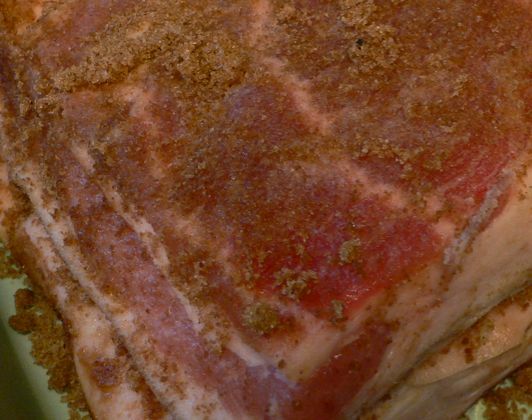 For the last two hours, you can remove the skin to get more smoke on the meat. 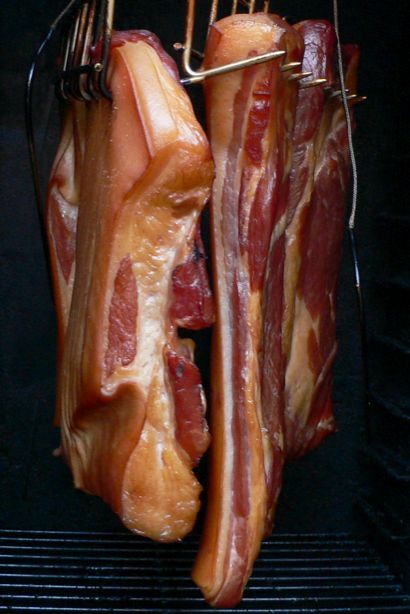 Here's the bacon at the start of the smoking process. 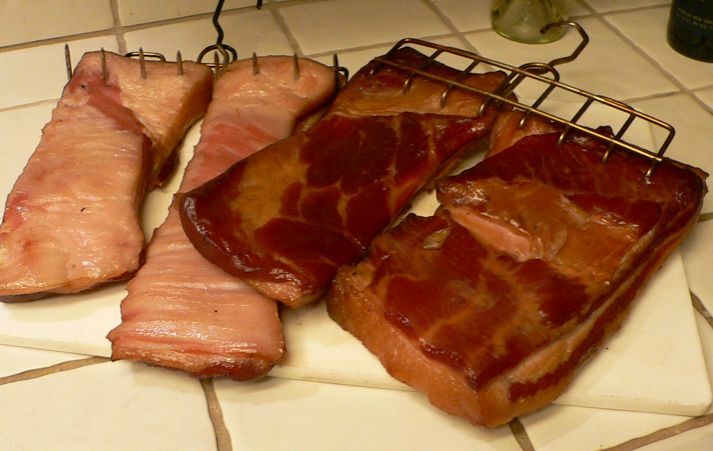 I used a combination of plum and apricot wood for the smoking. A friend had to have two trees remove. Why a combination? Because I honestly can't really tell them apart. After 8 hours, the bacon is starting to look pretty good! 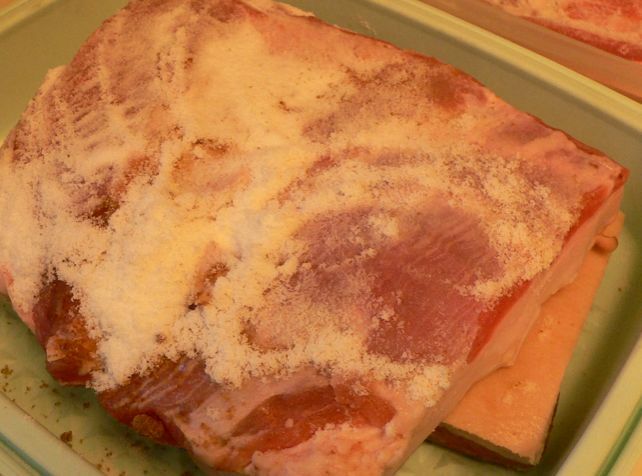 Right after this picture, the skins were sliced off so that the fat side could also get some color. Leaving the skins on before this point is helpful to keep the bacon from becoming too soft and possibly stretching off of the "bacon hooks" on which it is hanging. Final bacon. One set fat side up, the other fat side down. Last night a really silly kitchen gadget showed up in the mail. A Raytek ST20 infrared thermometer. Basically, what this does is let you take the surface temperature of something (ie, pans, ovens, oil, BBQ/smoker chamber, fridge shelves, etc) from up to (get this) 12 feet away. And with a reading in half a second, it's also really quick. As an added bonus, it comes all loaded with the battery and ready to play with. Literally seconds after removing it from the box I was pointing it all over the place and measuring. It shows the maximum temp since you started reading, and has a visiible laser pointer to show where you are aiming it. Okay, so it isn't a "Phased-plasma rifle in the forty watt range. ", but it's still darn fun.